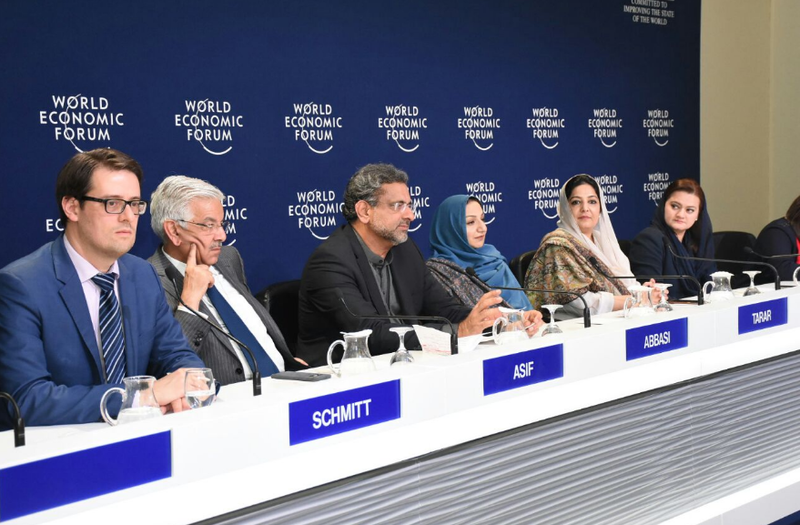 ISLAMABAD/DAVOS: Prime Minister Shahid Khaqan Abbasi, while speaking at an event on the sideline of the 48th Annual World Economic Forum, Thursday said that Pakistan would exercise all options to retain its sovereignty, as it faces serious challenges from its two neighbours, particularly India that has aggressive designs. “Consolidation of democracy in Pakistan is a positive indicator and all institutions should work hand-in-hand for development and stability of Pakistan,” the premier said at traditional Pakistan Breakfast, organised by Pathfinder Group, in Davos. The prime minister said the China-Pakistan Economic Corridor (CPEC) would provide dividends for centuries to come in the shape of employment generation, industrial growth and connectivity. He said Pakistan was privileged to be part of the visionary Chinese leadership’s Belt and Road Initiative. The meeting was also attended by Pakistani businessmen, media representatives, friends of Pakistan from several nations. Abbasi said his government, on assuming power, faced major challenges of law and order, terrorism, energy shortage and an under-performing economy. He said due to the hard work and commitment of the government, law and order had improved considerably and restored investors’ confidence. “I met several business leaders here in Davos and all of them expressed a strong desire to invest and expand businesses in Pakistan,” the prime minister said. Elaborating the success achieved in eliminating terrorism, he said Pakistan has fought the war against terrorism using its own resources, with a heavy toll on human lives and substantial loss to the economy. Pakistan had been hosting around three million Afghan refugees since long, which was the longest and largest refuge provided anywhere around the globe. He said that Afghanistan does not need a grand strategy but peace. Whatever it takes to bring peace in Afghanistan, Pakistan will do that, as we firmly believe that war is not the solution. He said that Afghanistan is not manning its 2200 kilometre long border with Pakistan. “The ills of Afghanistan do not emanate from Pakistan”, said PM Abbasi. Pakistan would exercise all options to retain its sovereignty, as it faces serious challenges from its two neighbours, particularly India that has aggressive designs, PM Abbasi said, adding that a nuclear India has aggressive designs against Pakistan, and the country has the right and responsibility to counter that design. The world must acknowledge Pakistan’s efforts and sacrifices, he said. Regarding the progress made on the energy front, he said Pakistan had surplus gas and overcome energy deficiency in a sustainable and efficient way. “We have diversified our energy mix and with the inclusion of coal and gas instead of expensive conventional fuels,” the prime minister said. The PM also reminded the world that US President Donald Trump’s infamous tweet about Pakistan did not reflect the ground realities. “In today’s world healing fractures is the primary concern and wars only create fractions,” said the PM, adding that Pakistan will protect its sovereignty and territorial integrity. Pakistan had achieved high economic growth with low inflation and it was a positive scenario augmenting greater investor confidence, he said, adding Pakistan had completed 1,700 kilometres of six-lane motorways under the CPEC, a target which many developed countries found hard to achieve. He said Gwadar port was operational and provided world-class shipment and logistical facilities. Emphatically, he said, there are two Pakistan: One on the CNN and the other is the reality, and I invite the global investors to come and see the real Pakistan. PM Abbasi also said Pakistan, with a huge market of 200 million people, an annual economic growth of around six per cent and a strengthening democracy, was open to business and investment in diverse areas. He mentioned the huge economic activity generated by the CPEC project in the country. The prime minister highlighted the strengthening of the political situation in the country, saying Pakistan was making history by completing a decade of the democratic process. To a question about growing Pak-China ties, he said Pakistan had longstanding relations with both China and the US, which the country considered very important and would continue. “We are a country where warm winds are blowing from the East and the West,” he remarked. He said the CPEC was not a Pakistan-specific project, as it would benefit the region and was open to other world countries as well. Later, during the meeting with Trafigura CEO Jermy Weir and Puma Energy CEO Pierre Eladari, at the sidelines of WEF in Davos, he said the present government had established liberal and attractive policies for international investors and ease of doing business framework was in place. Special Assistant to PM Ali Jehangir Siddiqui and senior government officials were also present during the meeting. The PM, appreciating their current investment in Pakistan, invited them to further expand investments in Pakistan in diverse sectors. He apprised that the country had achieved significant economic stability and improved law and order situation, boosting the confidence of local and foreign investors to invest in Pakistan. The government had undertaken mega energy projects to address the energy issue faced by the country, the prime minister emphasised. He assured them that the market holds a lot of potential for their business. Both the CEOs thanked the prime minister and expressed hope to further expand their operations. Meanwhile, during a meeting with ENI CEO Claudio Descalzi, he said the present government had been successful in meeting energy needs of commercial, industrial and domestic consumers. Abbasi appreciated ENI’s continued presence in Pakistan and its efforts for the socio-economic uplift of local communities. He welcomed ENI’s pro-active role in bridging the energy demand-supply of Pakistan. He also acknowledged ENI’s engagements in numerous sustainability projects, providing access to water, socio-economic development, education, health and environmental protection. The ENI CEO thanked the prime minister and expressed full support in offering solutions for providing sustained energy supply to Pakistani consumers. PM Abbasi also met founder and Chairman of the World Economic Forum (WEF) Professor Klaus Schwab, in a bilateral meeting at the sidelines of the WEF Annual Meeting 2018. 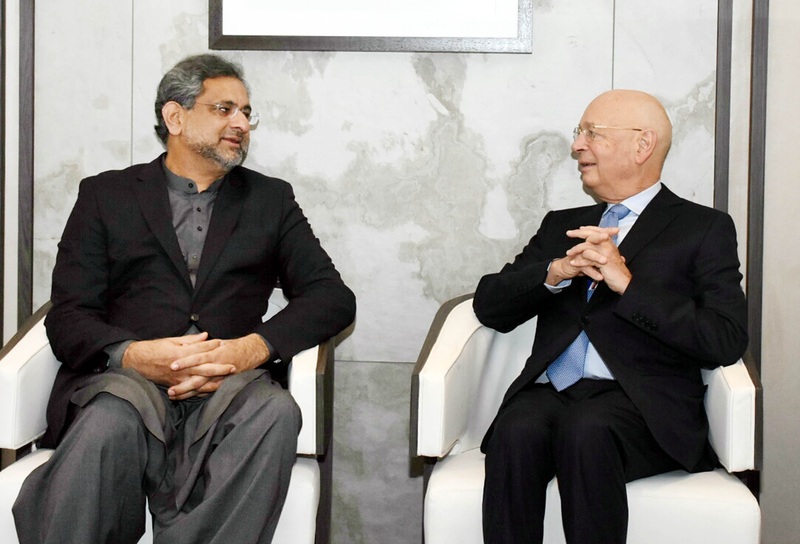 Professor Schwab discussed with the prime minister the economic situation of Pakistan. The prime minister apprised the WEF chairman that Pakistan’s economic growth would reach 6pc this year. Professor Schwab appreciated the efforts and measures taken by the present Pakistani government for registering a significant growth in the economy. He also noted the size of the young population of Pakistan and appreciated the prime minister’s focus on creating jobs for the youth in the country. In a yet another meeting, PM Abbasi called on Jean-Yves Charlier, who is the Group CEO of VEON (operating under brand name Jazz in Pakistan). Minister of State for Information Technology Anusha Rehman Khan, Special Assistant to PM Ali Jehangir Siddiqui and senior government officials were also present. During the meeting, Abbasi appreciated VEON’s investment, performance, and corporate social responsibility (CSR) activities in Pakistan, including mobile learning and relief efforts rendered during natural disasters. He also acknowledged VEON’s investment in the training and development of its workforce and thanked the CEO for providing many Pakistanis with the opportunity to work in a progressive and learning environment. VEON CEO thanked the PM for the support provided by the government in facilitating VEON’s operation in Pakistan, and acknowledged the country’s successful drive towards digitisation. “VEON fully supports the digital vision of the present government and remains committed to supporting it through innovative solutions,” the CEO added. Later, in a meeting with Renault-Nissan CEO, the Prime Minister informed the chairman that Pakistan is expected to become a 500,000 annual car market by 2023.